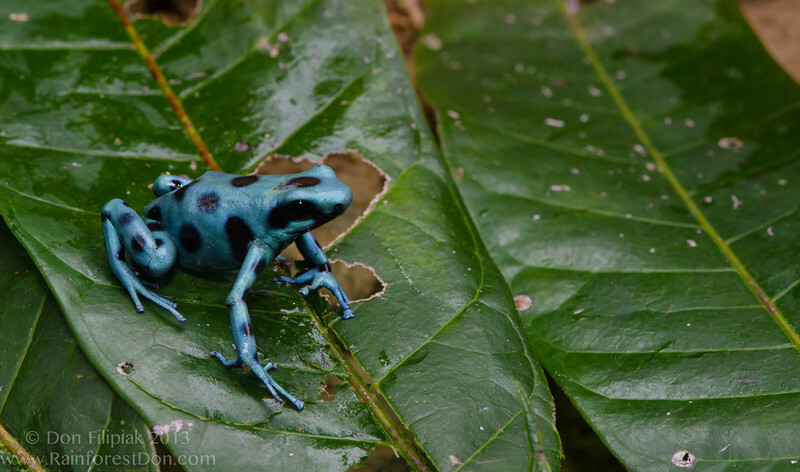 Green-and-black Poison Dart frogs (Dendrobates auratus) display a dizzying array of color and pattern variations, which reaches its peak diversity in Panama. Macedonio and I set out early one morning from the Pacific mountain town of El Cope, Panama and started our traverse up and over the continental divide. After crossing over the divide, we traveled down the Caribbean slope until we reached our destination- the small village of Santa Marta. Now, the night before, Macedonio had told me that the Dendrobates over there were "celeste- no azul, no verde, pero, son celeste". Blue, green, blue/green, whatever color I had in my mind could not prepare me for seeing this beauty! This trek was full of amazing spectacles- stream crossings, riverside rocket frogs, herds of toadlets, 20 meter high rainforest waterfalls with hidden pools, and even a pygmy owl smaller than my hand! But it was this celestial frog that stole the spotlight for the day!